In high school, most of us learned that DNA is the bible. It encodes all the information our bodies need to function. It is our ultimate instructor, our guide, and our fate, all wrapped up in one molecule. In this conception of biology, only the traits recorded in our genetic code are expressed in us and are passed on to our children. But data accumulated over the past few decades show this understanding is incomplete. DNA is by no means the sole presider over gene expression. Many other mechanisms work independently of the molecule to determine our traits and personalities. These non-DNA mechanisms are crucial arbiters that determine how our genes are – and aren’t – expressed. They are often triggered by environmental conditions and lifestyle, and thus reveal a link between our choices and our genes that was formerly unknown. The study of the way non-DNA mechanisms switch genes on and off is called epigenetics. There is a whole world of genetic add-ons, re-windings, tweaks, and tugs that we’ve barely begun to understand. Although there’s much work left to be done, the last few decades of research in epigenetics has already hugely expanded our vocabularies. Now when talk about genes, we talk not only about DNA, but also about RNA interference, methylation, acetylation, histone modifications, chromosome structure, and much more. Here’s a look at three of the most important non-DNA gene regulators. DNA’s instructions are ferried out of the cell by messenger RNA. What’s one way to prevent commands from coming to fruition? Shoot the messenger. That’s what happens in RNA interference. It’s like a blood sport: short snippets of code, called micro-RNA and small interfering RNA, join forces with several proteins. Together they make a formidable tracking and destruction complex called RISC. The complex hunts down specific messenger RNA strands, clutches them, and promptly cuts them to pieces. The messenger RNA is completely annihilated, and the instructions it had dutifully carried from DNA to the rest of the cell never reach their destination. Without changing DNA’s sequence at all, RNA interference helps to determine which of DNA’s commands are carried out, and which are not. DNA is rarely a simple double helix as shown in the textbook diagrams. It is often decorated all over with molecular pieces called methyl groups, otherwise known as CH3. Where this little unit is added to DNA, genes become turned off. Where it’s removed, genes are switched back on. Methyl groups are thus like little stop signs. Where they’re added, the polymerase molecules that copy DNA’s instructions into RNA pieces hit the brakes. Where methyl groups aren’t present, polymerase knows to transcribe away. When DNA is replicated to make a new cell, the methyl groups are re-added exactly where they existed on the parent strand. Scientists don’t yet agree on exactly when and why DNA is methylated. But they do know that your habits and activities result in more or less methylation. Thus you indirectly determine the way your cells read your own DNA. Even changes to the way DNA is stored in the nucleus can alter gene expression. Stretched out, the DNA in a single microscopic cell is three meters long. To fit it all into the confines of a tiny cell, DNA must be tightly coiled. Proteins called histones are essential storage units. Groups of eight histones form a barrel-like shape around which DNA is wound. The histones themselves are positively charged, and the DNA is negative, which means the two substances cling together, attracted by their opposite charges. Sometimes, the cell adds acetyl groups (COCH3) to histone proteins. This little chemical cluster neutralizes the positively charged histones, so that they are no longer so strongly attracted to DNA. When it’s more loosely wound around the histones, DNA’s instructions can be more easily transcribed and communicated outside of the nucleus. This means that adding acetyl groups to histones can subtly impact the extent to which genes are expressed. 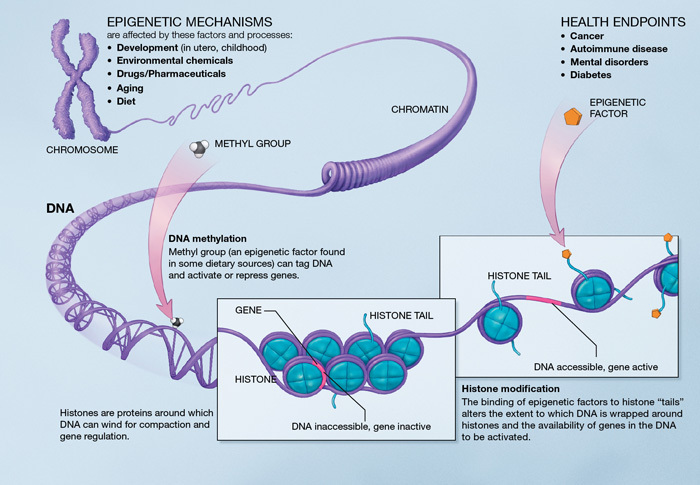 There are many more epigenetic factors that contribute, in large ways and small, to our genetically determined traits. The research area is a hot one right now, as scientists argue whether or not epigenetics validates a once-dismissed theory that your lifestyle choices can be passed on. If overeating leads to the addition of methyl groups to your DNA, and if methyl groups can be passed on to your children, then are you dooming your offspring to obesity by eating too much yourself? These questions have large implications for our understanding of genetics, heritability, and ourselves. If you find the explanations unclear or have further questions, please drop us a line on the forum. We welcome your comments, suggestions and feedback.